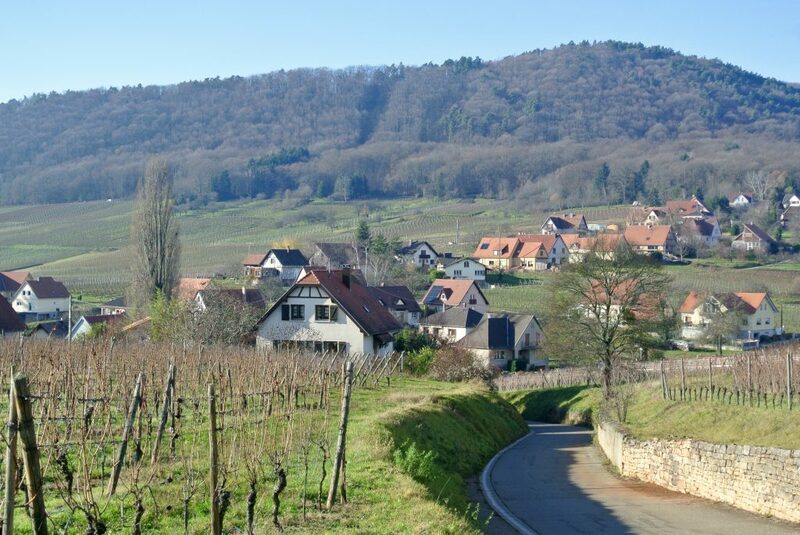 Quaint villages, sprawling landscapes, and hilly vineyards make up the Alsace wine region. 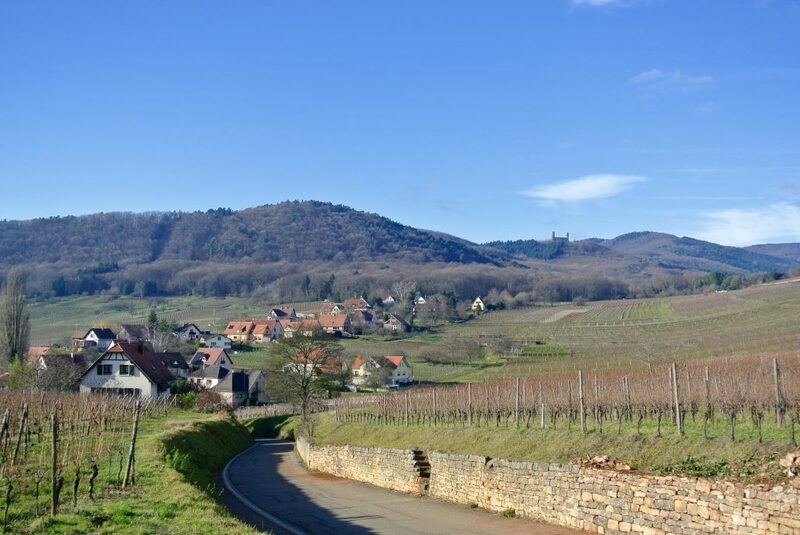 The Alsace Wine Route (Route du Vin) itself is an incredible road to drive along, stopping at villages along the way for coffee, wine tasting, or even just a stroll. If you go around Christmas, it’s even better. Add in the Alsatian Christmas markets and delicious vin chaud (mulled wine) and you’ve pretty much ended up in a real life fairytale. 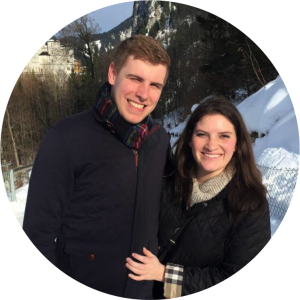 We spent a weekend in Strasbourg with my brother and his wife; on the last day, they had already gone and Sean and I had the entire day to make our way from Strasbourg to Basel, Switzerland, where we were dropping off our rental car. 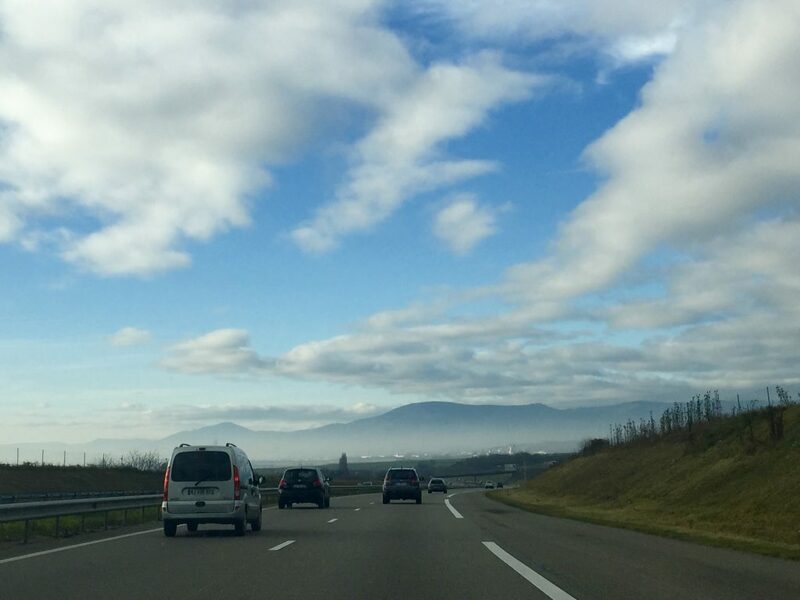 We saw that as the perfect opportunity to discover more of the Alsace wine region by driving as much of the Alsace wine route as we had time to cover. 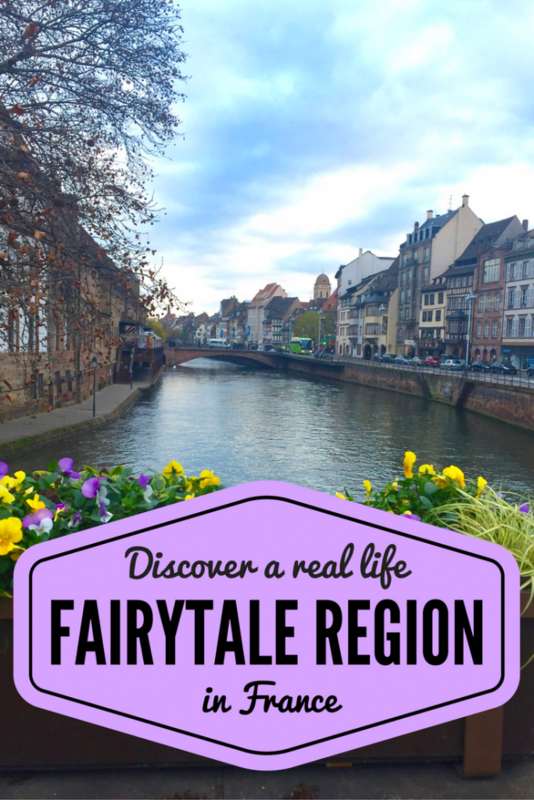 This guide contains a mix of information from the three different stages of our trip – the day spent in Strasbourg, the day spent tasting some incredible Alsace wine, and our mini road trip down the Alsace Wine Route. The wine route (or route du vin) is easy to follow, but things are close enough together that you can also visit the villages out of order if you have a specific agenda. 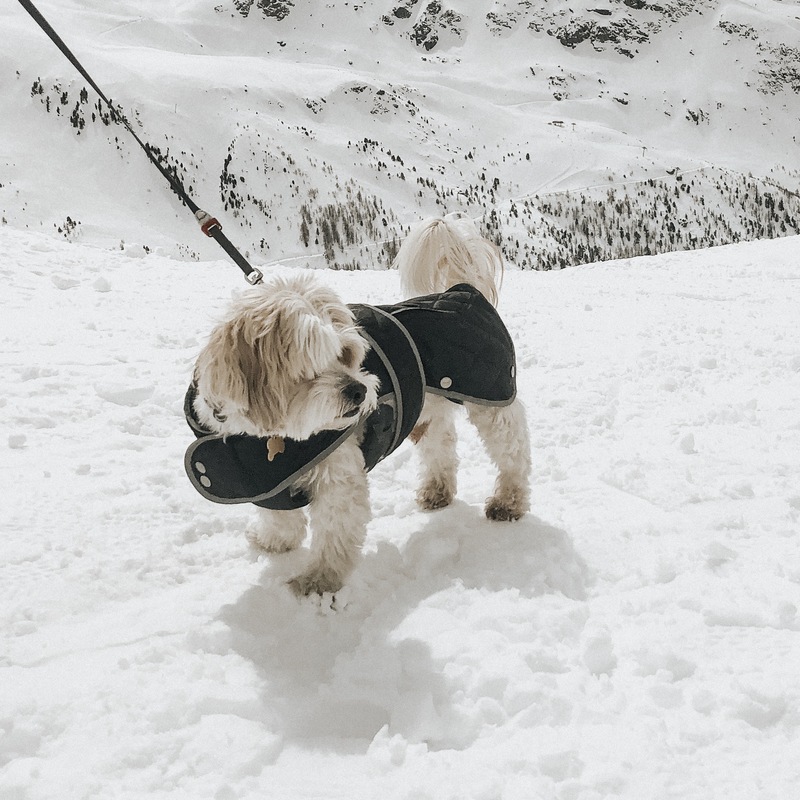 We highlight our favorite villages and some must visit spots below. All Christmas lovers will obsess over Strasbourg in December. Market stalls fill every open space in Strasbourg, lights line the streets, and everything emits a Christmas vibe. 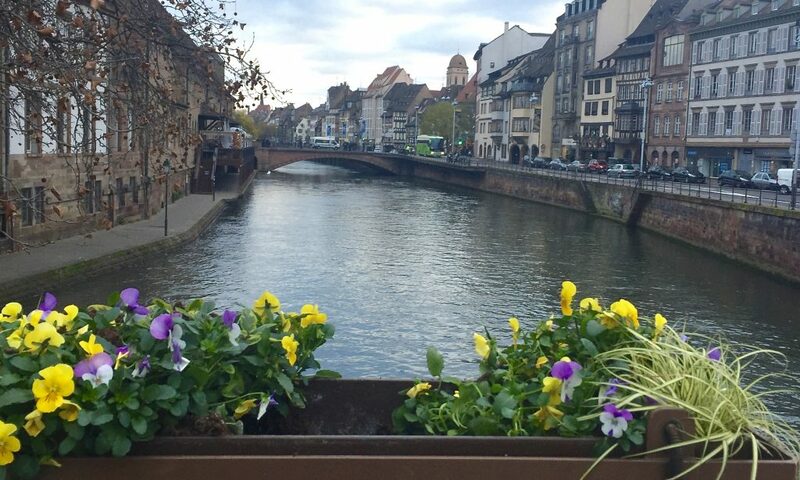 Strasbourg, France sits at the top of the Alsace Wine Route, making it the perfect place to base yourself when exploring the Alsace wine region. 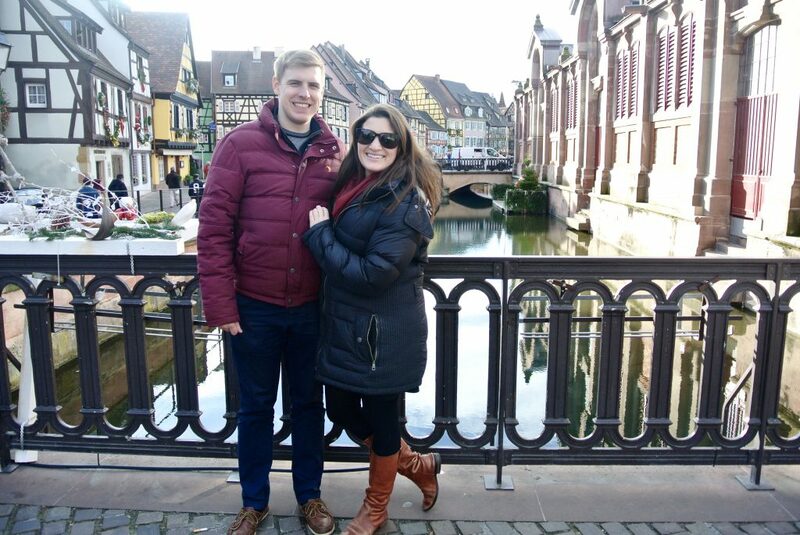 We did not visit many tourist attractions in Strasbourg because our priorities for this trip were wine and Christmas markets; however, we were able to make it to a few of the city’s sights. Our Airbnb overlooked the Cathedrale Notre-Dame, which sits in the center of Strasbourg. It is absolutely beautiful on the outside and inside. There are incredible stained glass windows and an astronomical clock which is highly regarded (we did not stick around to see it, though). For the Christmas season, they had a beautiful nativity scene setup inside for viewing as you walked around the Cathedral. We also visited Cave des Hospices de Strasbourg, a sort of wine museum which houses a barrel of wine from 1472! It’s only been drunk three times – can you imagine what it must taste like? The only downfall was that they did not appear to offer tastings of Alsace wine in the museum, though they did have wine for sale. In terms of Alsace Christmas markets, the ones in Strasbourg are probably the most well known and definitely the largest. The entire city appears to be covered in market stalls and Christmas decorations, with the stalls selling local handmade goods and treats. Half-timbered house candle holders and mulled wine (vin chaud) were the stars of the show, but the markets also had adorable ornaments and the most delicious food. The market in the Cathedral Square is great, but as you walk throughout the city, you’ll find smaller markets nearly everywhere. Many of the stalls offered similar things, but do not buy the first thing you find. It’s so fun to explore the markets and see the variety. I recommend you do that, and then go back and buy your true favorite item. We struggled to find places to eat while we were in Strasbourg (and the region in general). Because the Christmas market season is so popular in Alsace, restaurants are booked out and do not save space for walk ins. I recommend booking in advance for all meals to be on the safe side! We ultimately found a place we could walk-in in Petite France, which is another lovely part of Strasbourg to walk around. There is something so refreshing about taking a road trip, even if it’s just a quick one. Being on the open road with gorgeous views, an incredible playlist, and someone you love is one of the best ways to spend a day. As we set off from Strasbourg, we hopped on the A35 and then cut over to the D35 (Route du Vin), which is the road that goes through all of the villages. 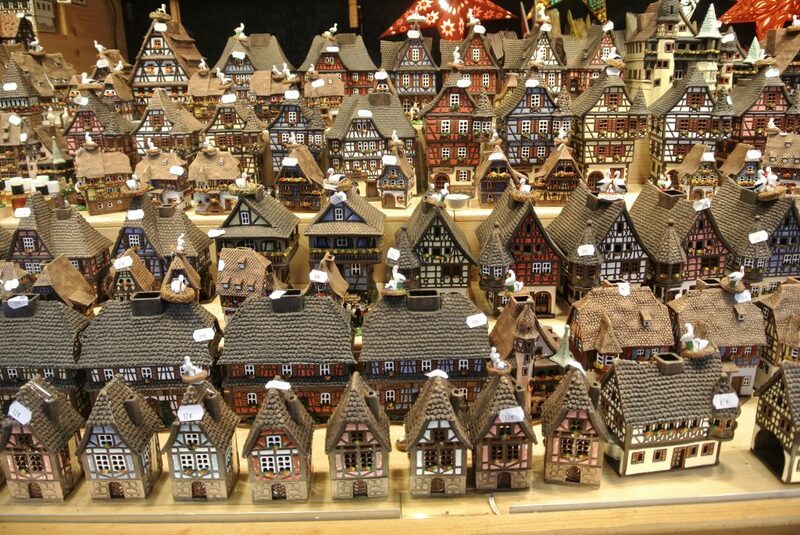 Pretty much each village had it’s own Christmas market, and it was fun to see how different each one was. In most of them, you pay a bit more for your first drink because it includes a souvenir cup. Keep your cup with you throughout the day to get more drinks, and return it at the end (to get €1 back), or keep it as a fun souvenir! We kept our cups from Strasbourg, Colmar, and Kayersburg. We visited some villages while we were wine tasting, and some on our road trip – here are our favorites! Alsace wine is a very unique (and delicious) wine, and each winery brought it’s own flavor to the grapes. 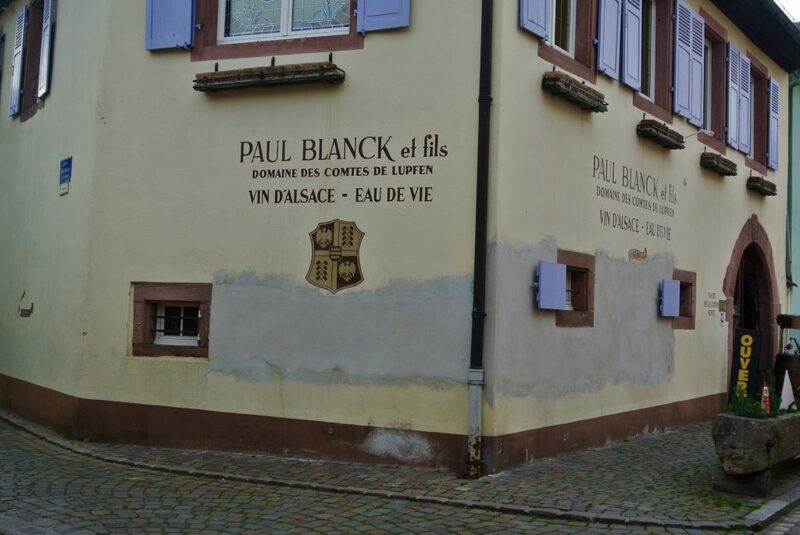 However, by far the best winery we visited during our trip was Domaine Paul Blanck in Keintzheim. 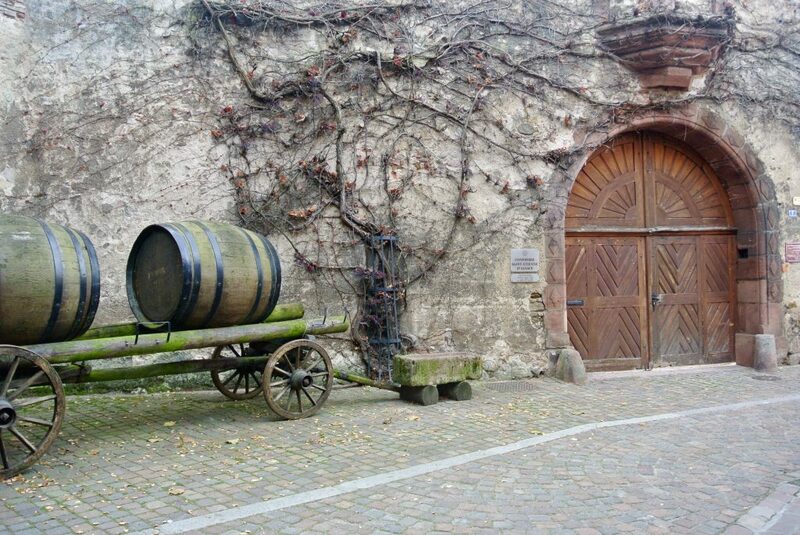 This is where we discovered our love for the Gewurtztraminer grape, and Alsace wines in general! Keintzheim is the most adorable town, with a large gate welcoming visitors, beautiful colored houses on cobblestone streets, and plenty of wine-related decorative accents. We absolutely loved our experience wine tasting at Domaine Paul Blanck. The Blanck family runs the winery in the truest sense of family-run businesses. The son of the winemaker even led our tasting. He was so knowledgeable and passionate and the wine was delicious! We’re lucky that they sell some in Waitrose here in the UK; it’ll definitely remain on our list of frequent wine purchases. Colmar is the definition of a fairytale town, straight out of a storybook.We all immediately fell in love with the place! There is so much color everywhere and the canals running through add to the romance and charm. Because Colmar is smaller and has more of a village feel than Strasbourg, it’s a great alternative for where to base yourself. It is still touristy but it maintains a village vibe even with crowded streets. Fun Fact: The creator of the Statue of Liberty was born in Colmar, and they even have a smaller model of Lady Liberty on the drive into town! 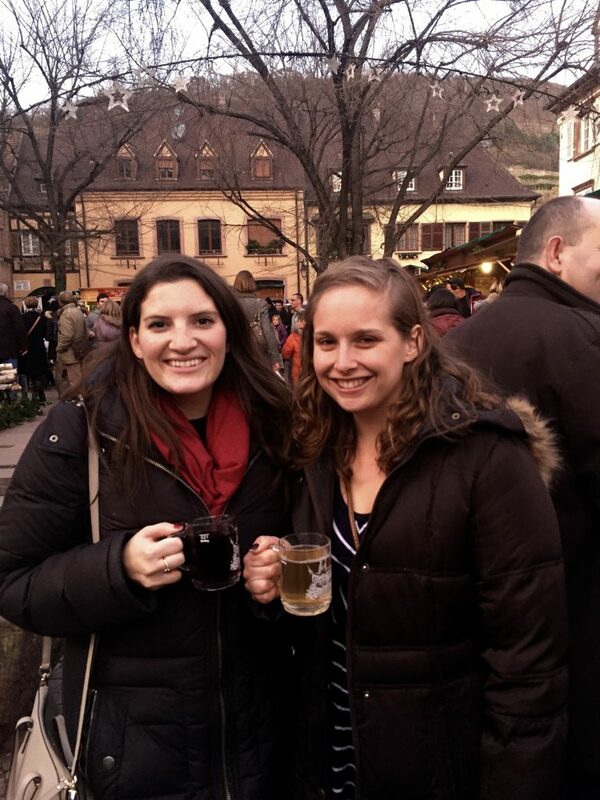 Our favorite Christmas market alone the Alsace Wine Route was the one we stumbled upon in Kayersburg. We headed that way as a recommendation from Phillipe at Paul Blanck and immediately fell in love. Unlike the Christmas markets in Strasbourg and Colmar, which were very commercial, Kayersburg had an authentic, Alsatian village feel. It really makes visitors feel like they are part of the village. The best part? The cups in Kayersburg were glass mugs, instead of the plastic cups we received in the other destinations. We drank our mulled wine very happily, walked around the Christmas market stalls, then packed up our cups to take home. Sean and I still drink hot drinks out of them all the time! 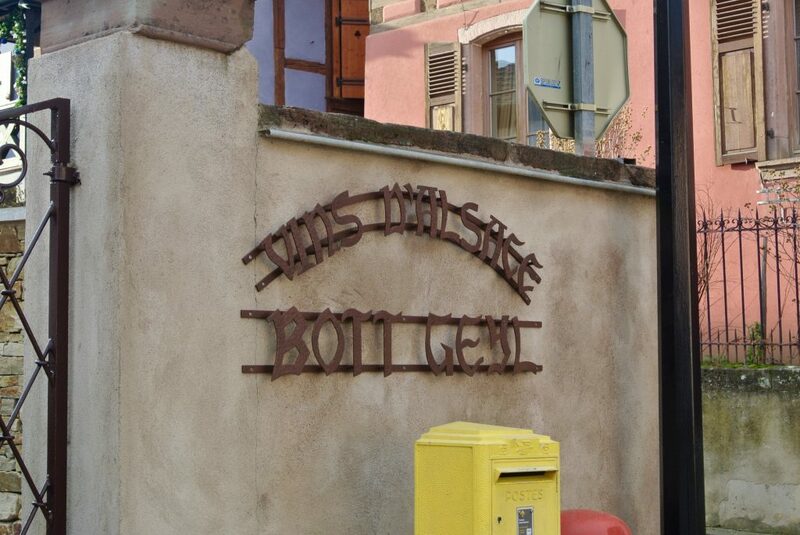 During our Alsace wine tasting excursion, we also visited Domaine Bott-Geyl in Beblenheim. We did not spend much time walking around the town, but the street that the winery on was so colorful and homey. We did not think the wine or the tasting experience were as good as at Domaine Paul Blanck, but we had the chance to learn a lot about the region and the varieties offered, which was a nice way to start our trip. For our road trip, Sean and I decided to hop on the D35 and just let it take us through all of the villages in order. We consulted Lonely Planet France to see if we actually wanted to stop in each town, or just drive through, and read about each one as we passed. The first village we stopped in was Obernai, just to grab a coffee. Mittelbergheim was the next stop, and as we looked for a place to turn around, we pulled into a parking lot that was actually an incredible viewing point. The car park is the start of a gorgeous walking path that we definitely would’ve done if we had time. Dambach-la-Ville was my favorite town to drive through of all the ones located on the Alsace Wine Route. The hills and vineyards reminded me of Italy. There were plenty of inns built into the hillside, offering incredible views of vineyards. 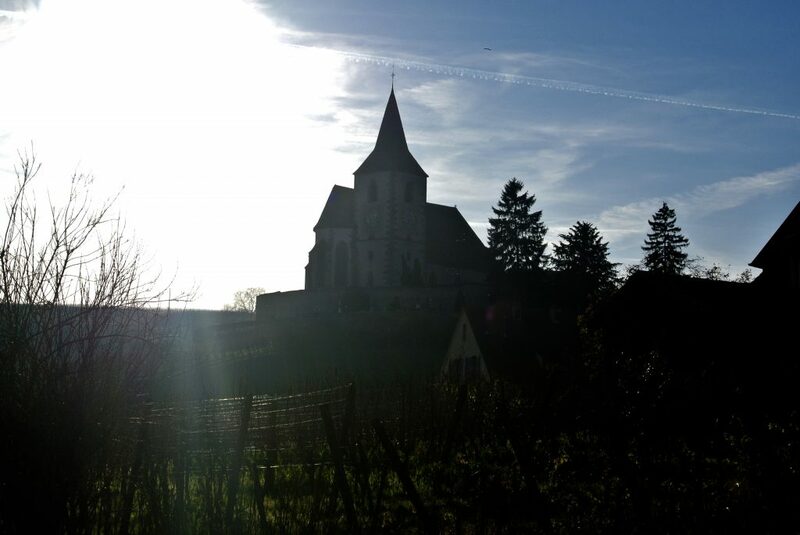 We did not get out of the car in Dambach-la-Ville, but I definitely want to return for a romantic weekend! We stopped briefly in Berheim, Ribeauville, and Hunawihr to find some lunch, but again struggled because everything was either booked or closed. In the end, we just grabbed a snack at one of the markets to tie us over! The one town that we did not visit our entire trip was Riquewihr. On our wine tasting day, we had plans to visit a winery there. No parking. Then, when Sean and I drove through the next day, we looked a bit harder and again, no parking. People were parking over a mile out and walking through vineyards to get into town. I imagine they must have an incredible Christmas market, but we just didn’t have the time to invest to find out. We went a bit out of our way after Dambach-la-Ville to visit Chateau du Haut-Koenigsbourg. We wandered up to the Chateau itself to find that we (obviously) arrived during their lunch hour. Instead of waiting around, we had a look around the public areas, grabbed a drink in the cafe, and spent time outside admiring the views. 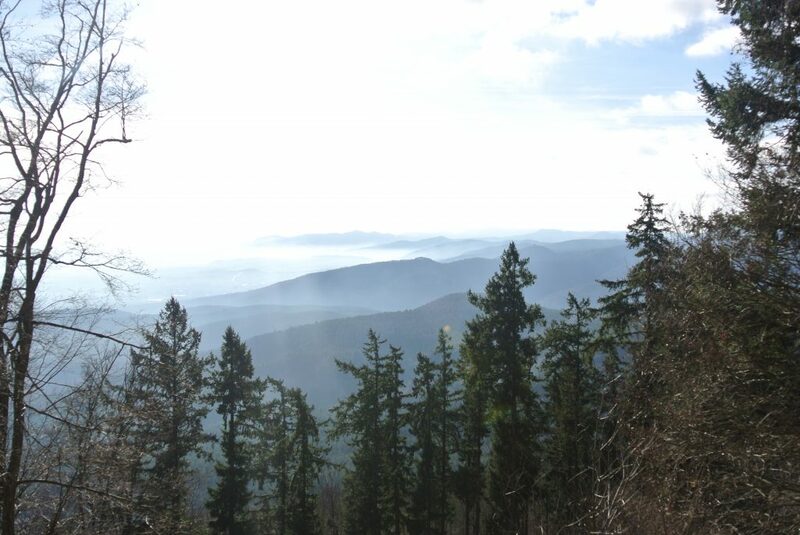 The mix of the forest and the mountains in the distance left me in complete awe. Where are you? Why, in the land of living fairy tales of course, where vineyards fade into watercolour distance, hilltop castles send spirits soaring higher than the region’s emblematic storks and half-timbered villages garlanded with geraniums look fresh-minted for a Disney film set. 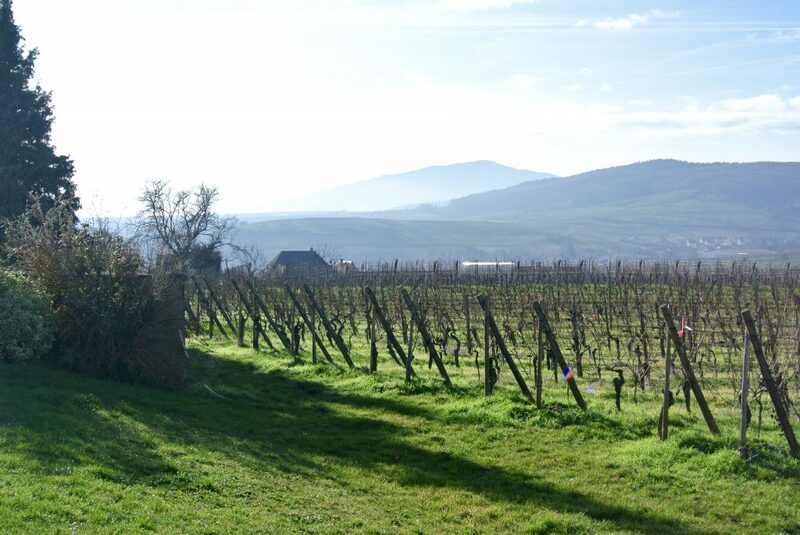 Alsace is such a beautiful region, and unlike any other I’ve visited. Even though the villages now all run together in my mind and I can’t recall exactly where we did end up eating during our road trip, I remember each place being more beautiful than the last. Each village charmed us in its own way, but they all shared the beauty of half-timbered houses, wine taverns, and gorgeous vineyard views. Getting There: Because we factored in a road trip, we found it cheapest to fly into Basel and drive. The drive from Basel to Strasbourg takes less than two hours, and train is also an option. Where to Stay: Outside of Strasbourg (and perhaps Colmar), there are few brand name accommodation options. Therefore, we recommend Booking.com to find a local inn or B&B. Length of Stay: We spent three days in the region. However, it would have been nice to have more time in each place. We recommend three days at a minimum, but you could spend up to a week exploring the region. This post contains some affiliate links. We only include links that we personally choose to include based on our experiences & preferences. If you click these links and make a purchase, we receive a small commission. 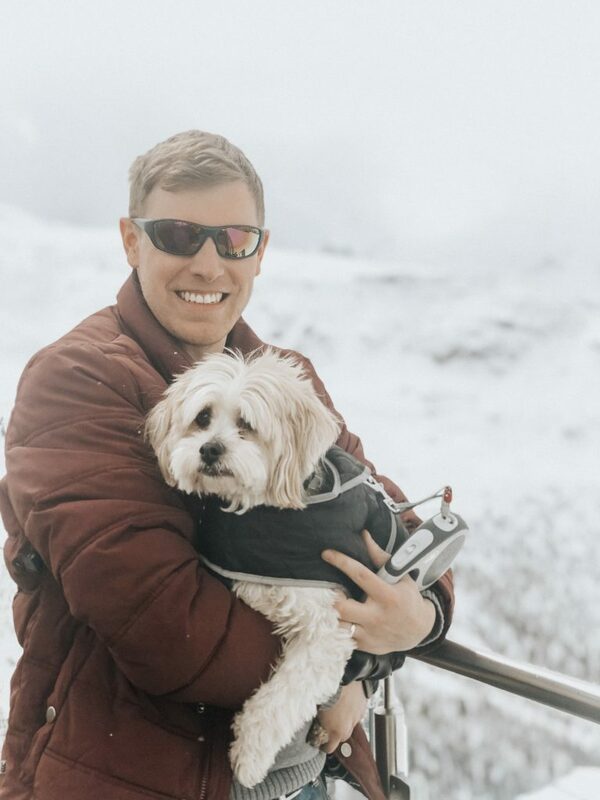 This helps us fund this blog and our travels, so thank you! Where is the most fairytale-like region that you have visited? I would have never thought that Alsace had such an incredible Christmas market! Good tip about the restaurants, though. I tend to pack food as it is (food allergy problems), but snacks only go so far! I also really liked that you pointed out the different towns you drove through! It looks like such a beautiful drive! Thanks for all your tips! The markets had plenty of food which was easy to get, but we sometimes just wanted to sit down! And it was a beautiful drive – if you’re thinking of doing a road trip sometime soon, it’s our top pick! Highly recommend it! The markets have that German style with a French flair which means everything is amazing! 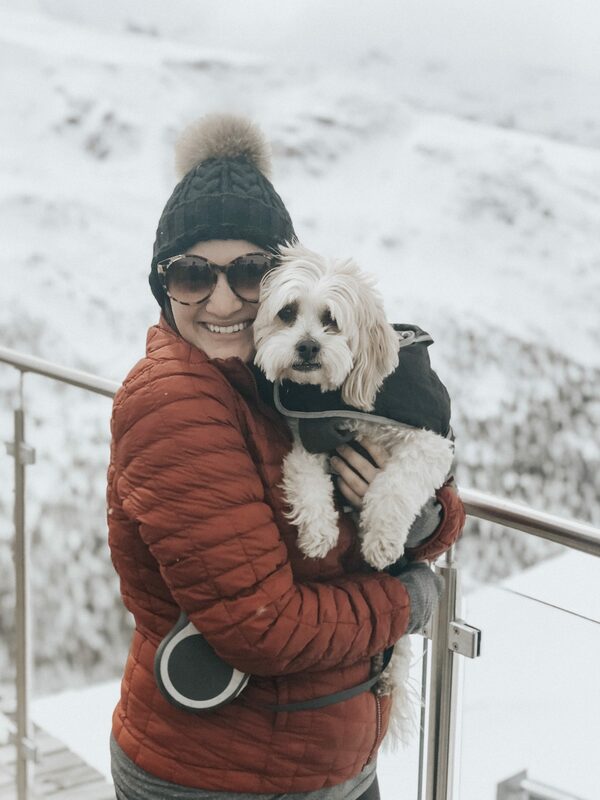 Loved reading your blog of Alsace region and your travel philosophy. 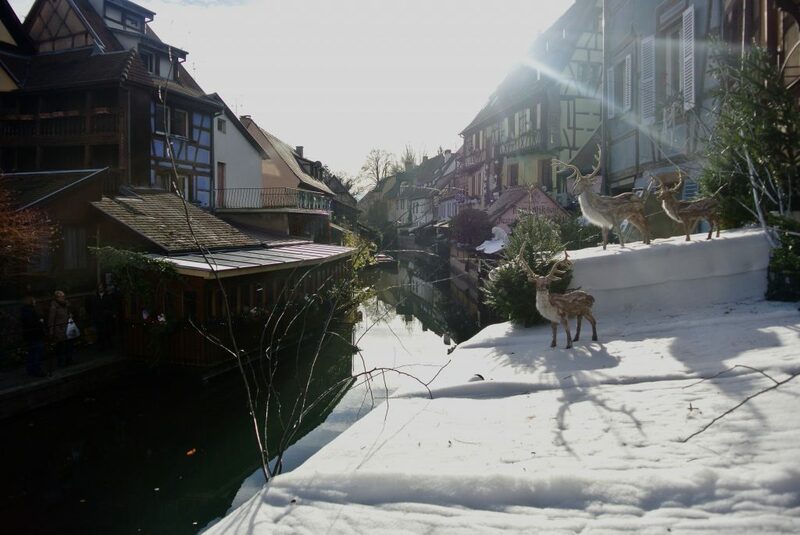 We will be staying in Colmar for first weekend of Christmas market and definitely making a note of the parking and dinner reservations in the villages. 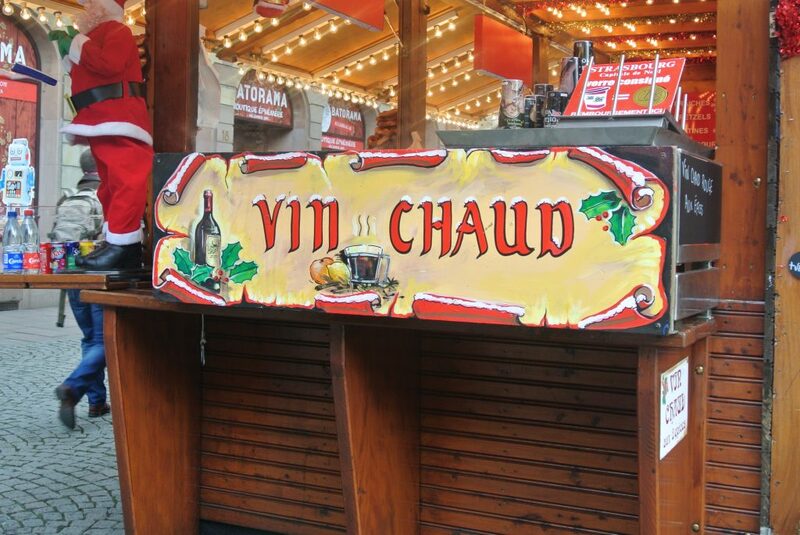 We were thinking of renting a car in Colmar to see the Route du Vin, but will now research other options. Looking for a place to learn about the region’s wines (don’t care for the sweet ones) and sample, maybe with a food pairing.. and a tour of some villages so we don’t have to drive and park.